Any social or corporate party you host at the Phoenixville Foundry during the holiday season is sure to be merry and bright. It is, after all, the most joyous time of year. We understand that it can be overwhelming, too. So much cheer to spread, so many loose ends to tie before the start of a new year. That’s exactly where we come in—taking care of all the heavy planning and setting the scene so you can enjoy the holiday to its fullest. Let’s say your team has been working really hard this year. This is a good opportunity to treat them to a wholesome sit-down holiday feast. Or perhaps you’re looking for an elegant retreat location that inspires and gets the team focused on your company’s newest goals—sounds like a conversation to be had on a warm couch near a blazing fireplace. People appreciate a well-thought-out holiday spread, especially when it entails a balanced mix of naughty and nice. For hors d’oeuvres, bring out those bright greens and reds in a bruschetta display; a colorful board of various cheeses, sausages and fruits is another crowd favorite. 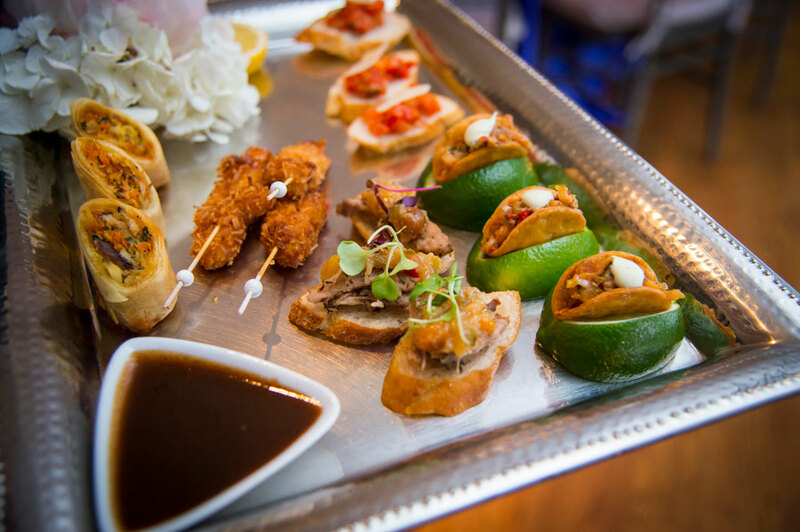 Or bring on the miniatures—mini tacos, mini sliders, mini crab cakes, mini pizzas. That way, you can maximize on the drinks or desserts later. Our corporate groups enjoy a delicious buffet or interactive station, especially when carved meat or mac and cheese is involved. Speaking of stations, may we suggest a hot chocolate one? We love to watch people light up at the sight of a silver urn resting on a table full of mugs and delicious toppings—marshmallows, pirouettes, cinnamon and chocolate-covered treats. Every holiday vision is different. Regardless of your palate, we ensure the freshest, highest-quality ingredients. With our exclusive catering partners, J Scott Catering and Queen of Hearts Catering, we can put together a plan that appeals to everyone. Instead of having your white elephant exchange at the office, why not bring the fun over to the Foundry? We have plenty of relaxing spots around the fire that would serve as good settings for this holiday activity. Or how about ornament decoration? Everyone gets an ornament, some felt or tinsel, or other craft materials to play around with and hang on a tree. Holiday trivia is another way to make the most of your celebration. What is the name of George Bailey’s daughter in It’s a Wonderful Life? How many players are needed to play Dreidel? What well-known Christmas carol was the first to be broadcast from space? There are many ideal spaces throughout the Foundry that would serve as the perfect setting for a band. The Cupola Ballroom is an 8,100-square-foot space that features 60-inch ceilings, a state-of-the-art sound system, a large, built-in dance floor and seating accommodations for 160 people. How about the Nutcracker score played by a professional orchestra? 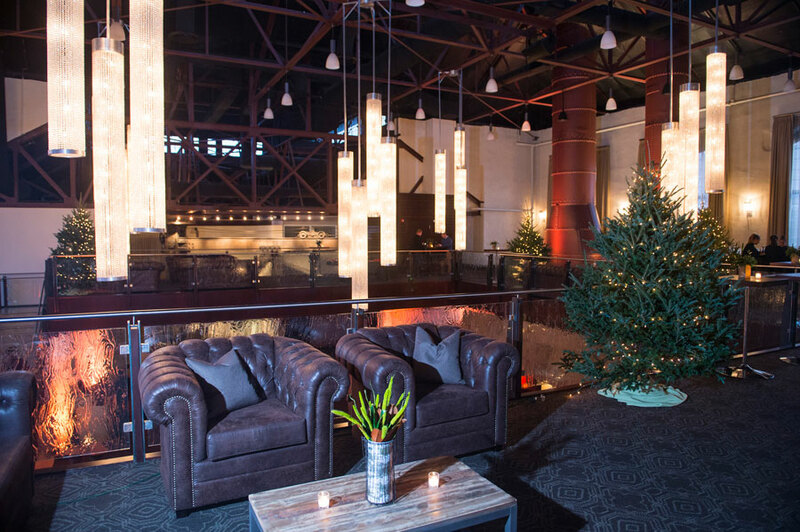 This beautiful space has seen its fair share of acrobats, dancers, musicians, DJs and other talented performers we are proud to partner with during holiday events. Don’t forget to make use of our outdoor spaces as well, which we keep warm and well-lit throughout the holiday season. 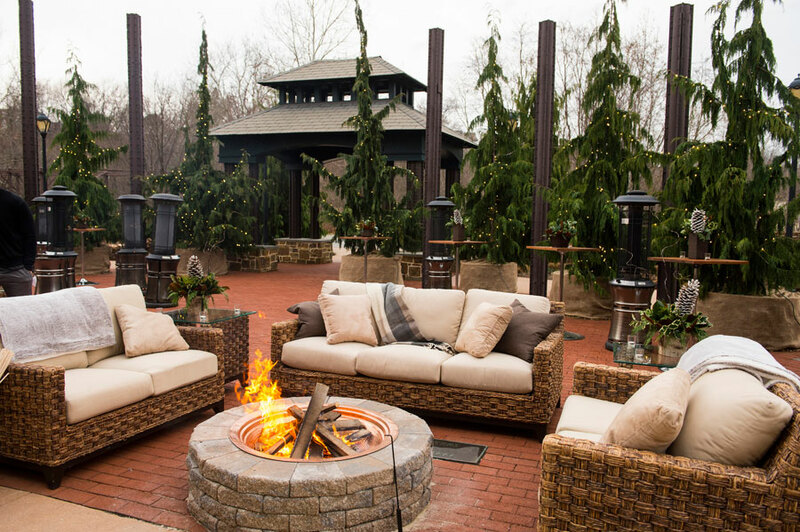 One of our favorite transformations of the outdoor space was the ski lodge a corporate client had envisioned. 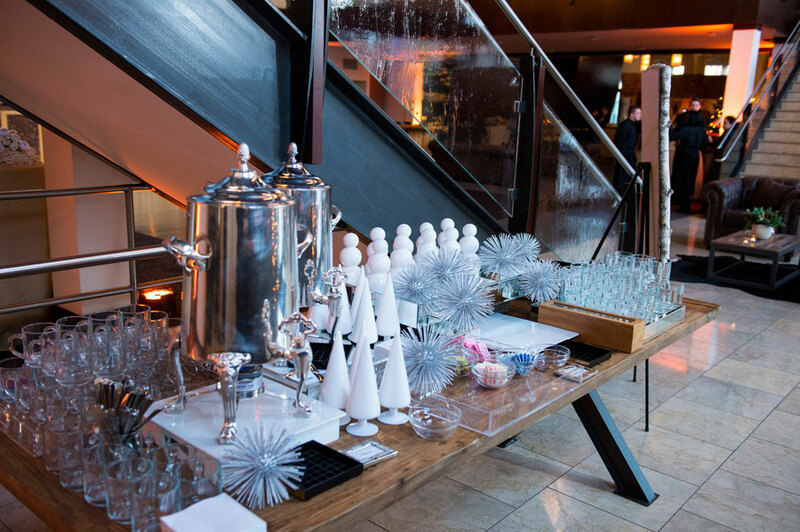 J Scott Catering’s inventive event designers, operations team and catering staff personalized a custom ski bar as well as indoor and outdoor fireplaces. Our creative team lives for the holidays. We would love to help you put together a holiday party that your friends and family or employees will never forget. Contact our experts online or give us a call at 610.725.9420.